While at D6, I picked a few books (shocking, I know). 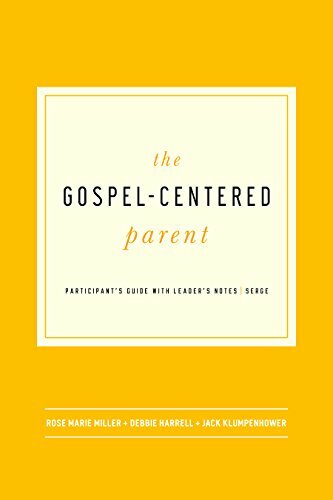 The one I decided to start with is The Gospel-Centered Parent by Rose Marie Miller, Deborah Harrell, and Jack Klumpenhower. I started here for extremely selfish reasons, my kids. My heart's desire is for them is to know, trust, and love the Lord. I'm also keenly aware that their spiritual development is on me as their dad. Scripture makes it clear that parents are to be the primary influence on their children including spiritually. The problem is, even as a pastor, I feel massively under equipped as well as somewhat under motivated. Add to that the fact that I'm teaching my kids all the time, sometimes intentionally, most of the time in unintentional ways. They see what I value, how I spend my time (on what and with whom) and hear what I talk most often about. They will follow the example I give them, whether it's a good example or not. This is scary to me because I don't always lead well or in a good direction ... and this is why I need this book. The Gospel-Centered Parent reminds parents that if we are not focused on making and keeping the Gospel central to all of life, it's foolish to think our kids will. We as parents need to grow in our faith, in ways our kids can see, if we expect them to desire it themselves. This book helps parents to see all of life, even the small and the mundane things, as worship. I'm only four chapters into this short book, mostly because I need time to process what I'm learning. This would be a great book for couples to go through together; or even a couple couples (in a small group setting). If your desire is to see your kids come to know the Lord; pick up this book, read it, and apply it. You won't regret it ... and neither will your kids.